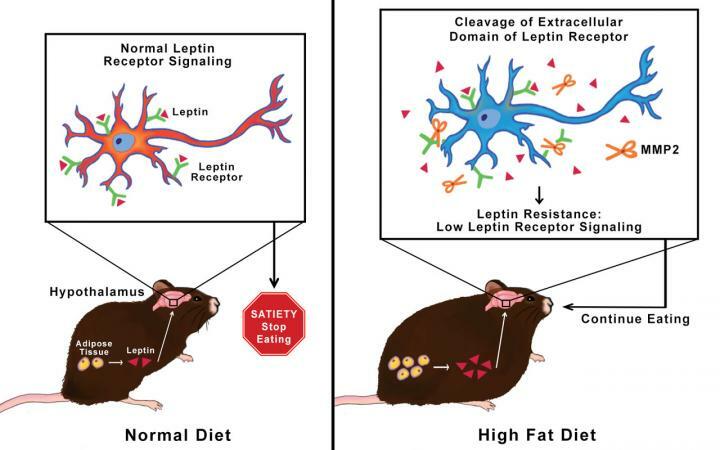 They found that mice fed a high-fat diet produce an enzyme named MMP-2 that clips receptors for the hormone leptin from the surface of neuronal cells in the hypothalamus. This blocks leptin from binding to its receptors. This in turn keeps the neurons from signaling that your stomach is full and you should stop eating. This is the first time that a destructive molecular mechanism has been observed and described. Scientists showed that when MMP-2 is blocked, leptin can still bind to the receptors and signal satiety. They hope that in the future, clinicians will be able to treat leptin resistance in humans by blocking MMP-2. They also have evidence that their findings have a broader scope. "We opened a new field of study for metabolic disease," said Rafi Mazor, a research scientist in the Department of Bioengineering at the University of California San Diego and the paper's first author. "We need to ask what other pathways, in addition to leptin and its receptors, undergo a similar destructive process and what the consequences might be." Mazor is part of a team that includes researchers from the University of California San Diego, the Salk Institute for Biological Studies in La Jolla, Tel Aviv University in Israel and Monash University in Australia. The team presents their findings in the Aug. 23 issue of Science Translational Medicine. While other research efforts have focused on studying pathways that block leptin from doing its job, Mazor and colleagues, under the lead of UC San Diego bioengineering professor Geert Schmid-Schonbein, decided to investigate the leptin receptor in the brain itself. "Our hypothesis was that an enzyme breaking down proteins into amino acids and polypeptides can cleave membrane receptors and lead to dysfunctional activity," Mazor said. He and colleagues are calling for a large-scale clinical trial to investigate whether MMP-2 inhibitors might help people lose weight. Those in the early stages of being overweight might be clipping their leptin receptors, but their neural pathways are still intact, Schmid-Schonbein said. Receptors are able to regenerate but it's unclear to what extent. "When you block the protease that leads to the receptors not signaling, you can treat the issue," said Schmid-Schonbein. Leptin molecules are released from white fat tissue during a meal. They travel through the blood stream into the brain, specifically the hypothalamus, where they stimulate neural receptors to signal that the stomach is full. People who are obese often have plenty of leptin in their blood, but it fails to lead to signaling satiety. Leptin resistance is a known process associated with obesity, but the molecular mechanisms by which it occurs were not understood. Researchers first tested brain tissue from obese mice for protease activity. This is how they found MMP-2, the enzyme that they suspected was damaging leptin receptors. Mazor and colleagues then developed a method to tag leptin receptors to see what was happening to them. They observed that MMP-2 was damaging the receptors, which lost their ability to signal. Researchers then used a recombinant protein to verify that the MMP-2 enzyme was indeed cleaving leptin receptors. They also cultured brain cells from mice and found clipped receptors when MMP-2 was present. Researchers genetically altered a group of mice to not produce MMP-2. In spite of being fed a high-fat diet, these mice gained less weight and their leptin receptors remained intact. Meanwhile, mice that were fed the same diet but were not genetically altered became obese and their leptin receptors were cleaved. In the long run, researchers aim to design an MMP-2 inhibitor or an inhibitor for the MMP-2 pathway of activation. Next steps also include confirming that the same mechanism occurs in human brain cells. "In the future, we will try to find out why proteases are activated, what is activating them and how to stop it," Mazor added. He and the team think that other membrane receptors may also be destroyed in the same way. "There is still a lot of work to do to better understand receptor cleaving and the loss of cell function while on a high-fat diet." The work was supported by grants from the National Institute of Health, the American Heart Association, Department of Veterans Affairs, Veterans Health Administration, Office of Research and Development, and the Foundation for Anesthesia Education & Research and the American Society of Critical Care Anesthesiologists.